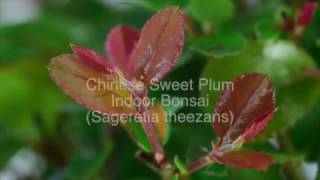 The Sweet Plum is a lovely indoor bonsai tree with lovely proportions and pretty small purple fruits durring summer. A highly refined bonsai with lovely full foliage pads and lovely trunk flow. Potted into a classic sea green oval pot with matching drip tray. A lovely indoor bonsai which displays small purple fruits as it matures. Beautiful twisty trunk flow and perfectly proportioned leaves. Small purple fruits. Potted into a lovely sea green oval pot with matching drip tray. * Pot details: sea green glazed oval ceramic bonsai pot.